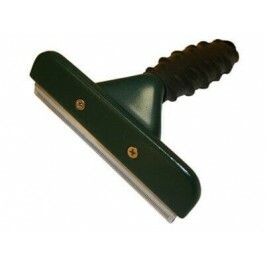 The FURminator deShedding tool for horses reduces shedding up to 90% by removing loose hair without damaging the coat. The stainless steel deShedding edge reaches deep beneath your horse's topcoat to gently remove undercoat and loose hair. Make sure the coat of your horse is COMPLETELY DRY. The FURminator deShedding tool removes a lot of hair, so it is best to groom your horse outside. Comb SLOWLY in the direction of hair growth. The grooming time with the FURminator deShedding tool varies by breed and condition of the horse's coat. Heavy hair loss can be due to a horse's health or his diet. Consult a veterinary surgeon in the case of excessive hair loss. The Furminator deshedding tool was designed to remove the winter coat. Do not use it on the mane and tail of the horse. 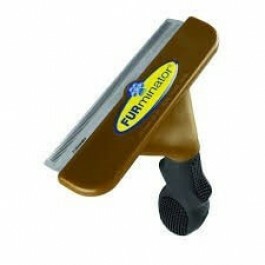 The FURminator deShedding tool consists of a finely serrated and highly precise edge, accompanied by a protective case. FURminator Inc. does not guarantee the tool in case of breakage of the teeth.